Soon after the successful launch, Arianespace chief executive Stephane Israel congratulated ISRO chairman K Sivan and P Kunhikrishnan, director of Bangalore-based UR Rao Satellite Centre, who were present at the Arianespace control room to witness the launch. He said the "cooperation with the Indian space agency went back to 1991 and today's launch has boosted that relationship". Thanking Arianespace for the launch, ISRO chairman Sivan said, "Six days after the successful launch (on November 29) of India's first hyperpectral imaging satellite HysIS, today's launch of the country's heaviest satellite GSAT-11 is a major milestone for the country. This satellite has been designed in most innovative ways by ISRO centres and the credit for its success goes to Team ISRO." 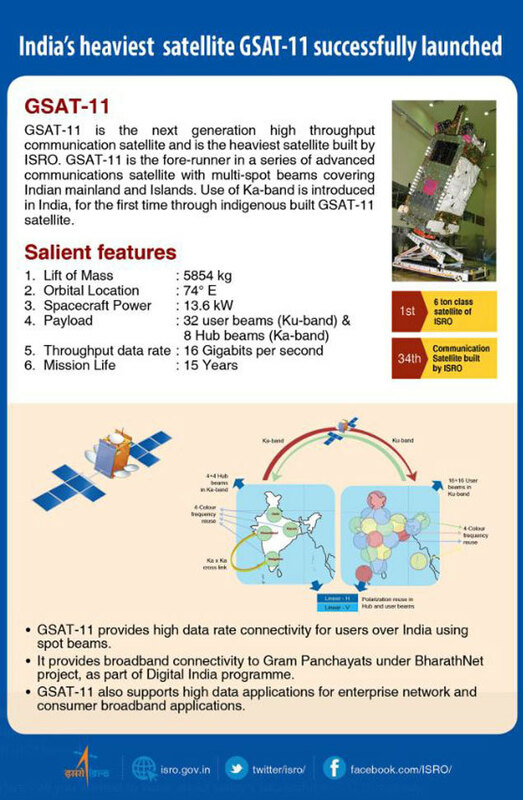 He said that "GSAT-11 is the third in a series of four high throughput satellites (GSAT-19, GSAT-29, GSAT-11 and GSAT-20) that will provide the country broadband connectivity of over 100 gigabits per second (Gbps) and will link rural areas and bridge the digital divide under the Digital India programme." While GSAT-19 was launched in June last year, GSAT-29 was launched on November 14 this year.